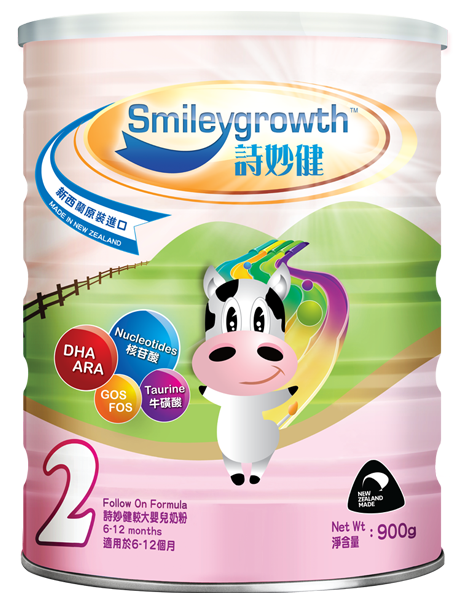 Smileygrowth™ milk powders have been developed for different age groups to give the best and most resolute assistance to body and brain development. Non-impaired growth is essential for lifelong health and it starts with perfect infant feeding formulas. Smileygrowth™ provides all-round nutrition for 3 important life segments: 0 to 6 months, 6 to12 months and 12 to 36 months. Breastmilk is the best food for your baby. According to the WHO's recommendation, babies should be breastfed exclusively in the first six months. Thereafter, they should be given nutritious complementary foods and continue breastfeeding up to the age of two years or beyond. With whole milk powder, this Cow Milk Powder is the perfect partner in promoting good health and providing the support necessary for the proper physical and mental development in very young children and in babies between 6 and 12 months old. For 12 to 36 months old infants, this Cow Milk Powder has the essential vitamins and minerals of the previous 2 formulas using whole milk powder plus some additions. The recommended amounts are 200ml of cooled boiled water mixed with 4 level scoops of powder and fed to the child 2 to 3 times per day.